Today is an exciting day for me! I have joined together with 5 other bloggers to bring you 6 ways to style white pants. I personally think it is OK to wear white pants all year. The only times of year I won’t wear them is when it is snowy and yucky outside, because the streets and sidewalks get brown with the things that are used to treat them. If you are new to my blog, and visiting from one of the other blogs, welcome! I am so happy you are here! Please stay awhile and browse around my blog. I love to blog about not only style, but DIY, home decor, and travel as well, so I would love it if you join me in my little corner of the internet. With it being Spring now you’ll be seeing white pants even more! We thought it would be fun to show you how many different ways you can style them. 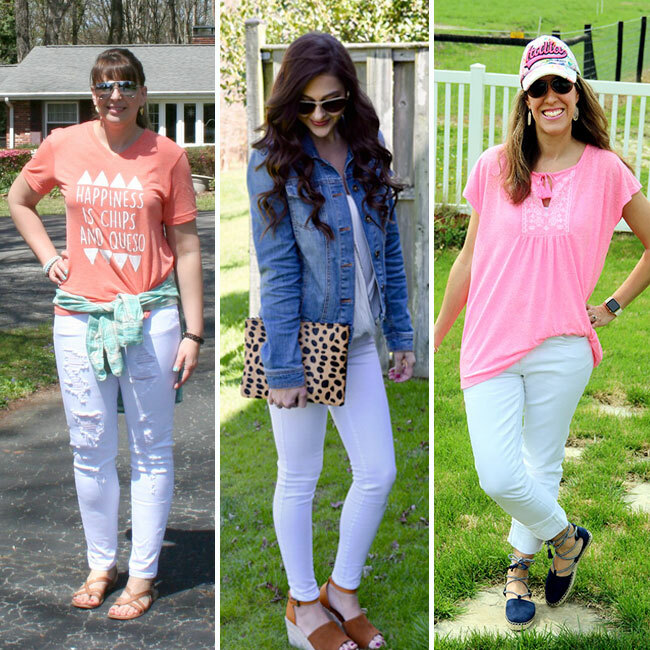 Each of us have our own personal styles, so be sure to stop by these lovely ladies blogs to see how they styled their white pants and to introduce yourself! 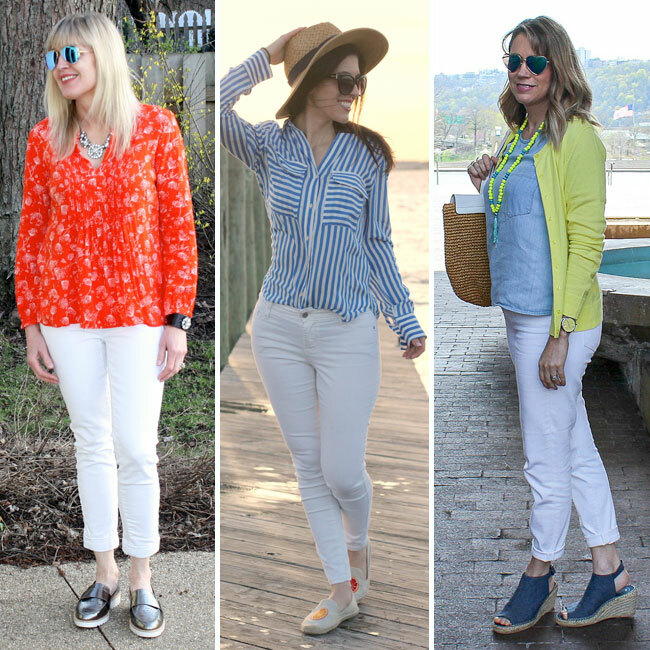 You will find links beneath each of these two collages, so you can visit each of these bloggers and read more about their own take on styling white pants. I think all of them look adorable! White pants are a classic look that can be dressed up or down, whatever the occasion, you can style them so many ways. Here’s a sneak peek at all the bloggers who are participating today, and 6 ways to style white pants! I wore this white jeans outfit during a family outing we took over spring break. We spent the day in Pittsburgh visiting the Carnegie Science Center, having lunch, and walking down by the river. It was a beautiful day, and these pictures were taken with the river in the background. 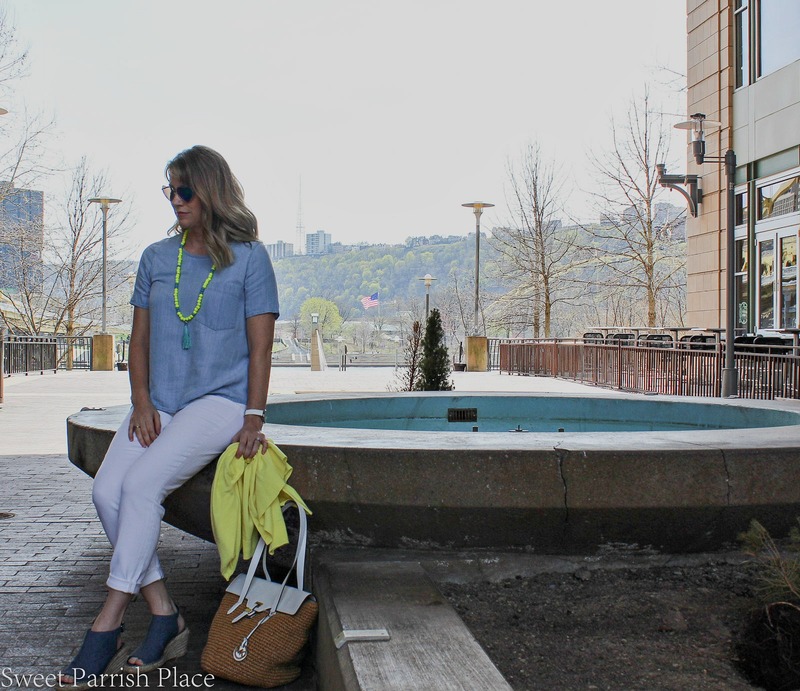 I paired my white jeans with a short sleeve chambray top, and then layered a yellow cardigan on top to give the look a pop of Spring color. I recently purchased this cardigan on clearance at Gap for $3.97! I was so excited at this find, because I have been wanting to add a yellow cardigan to my wardrobe for a couple of years now. I threw on this yellow and turquoise tassel necklace because it was a perfect match with the sweater. I love it when things work out like that. I just bought these white jeans recently as well, I have a couple of pairs, but I didn’t have a pair of skinny ones that were long. I bought my white jeans at J Crew Factory, and they are currently on sale for $39.50. I love the way these fit, and they are super stretchy and comfortable. I rolled mine up a couple of times for this outfit, but I can just as easily roll them down and wear them as long pants. These chambray peep toe sandals are another recent find. I picked them up at Gap Factory a few weeks ago, and I think they are going to be a fantastic addition to my wardrobe. They are currently on sale for $18.99! They were quite comfortable to be walking around in as well, so I was pleasantly surprised. My watch is from Chloe & Isabel, and you can change the band to either white or navy blue. The face of it looks like a lemon slice, so it was perfect to pair with this outfit! What do you think of my new bag for spring and summer? I love this straw and white leather Michael Kors bag! I am not the type to change out my bag with my outfits. Ain’t nobody got time for that! So this bag will be with me for the next several months. I have been wanting to collaborate with some other style bloggers for a long time now, so I am so happy to have been able to join together with these lovely ladies today, and we hope to work together to bring you more posts like this. So be sure to tell me what you think in the comments. I love your comments and read every one! Now don’t forget to visit my new friends today and show them some love! 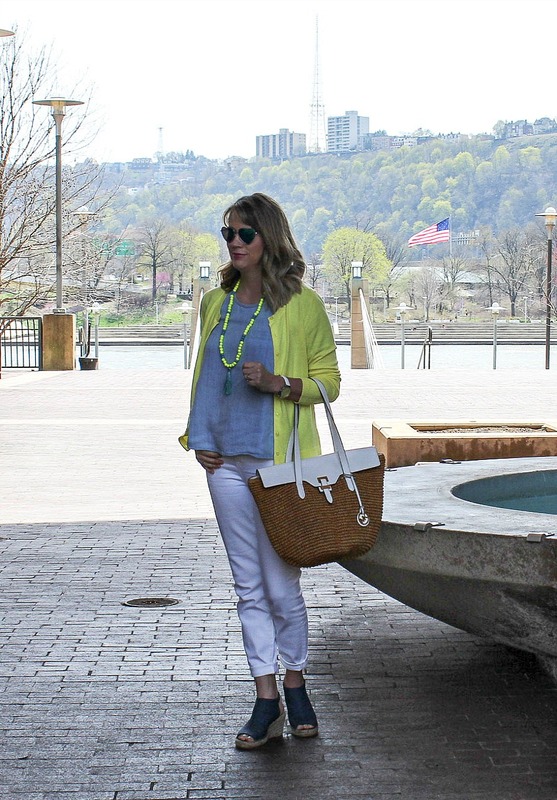 After you have visited them all you will have 6 ways to style white pants! 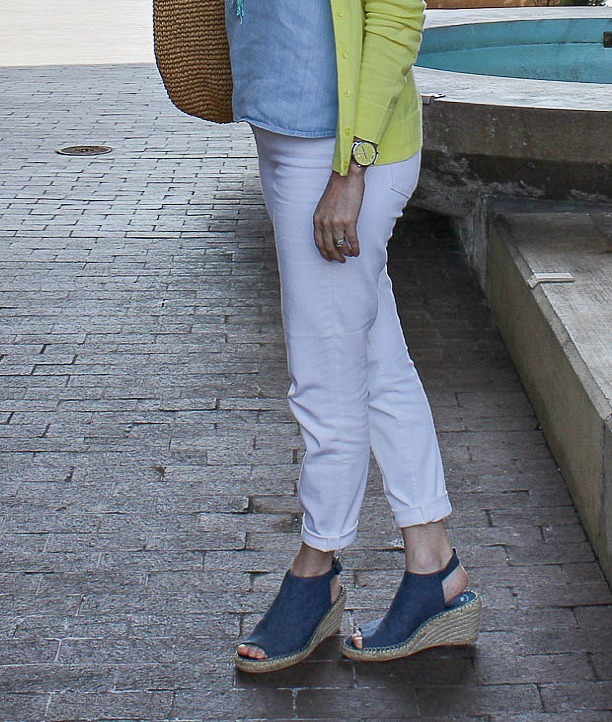 Chambray and white is my favorite combo, especially with a pop of yellow! Those shoes are perfect for summer too! The chambray top and shoes with the white denim is a perfect combination!!! I love your bright yellow necklace as well. Very pretty outfit, Nikki!! That cardigan is such a great find! I love the white styled with chambray and yellow! Thanks so much Jill! I was psyched to find it at such a cheap price! White jeans are so versatile. I love the different looks and yours! Thanks you so much Jessica! Glad you stopped by! I just picked up a pair of white pants from J. Crew, but the outlet store. I love the scenery in your photos and the pops of neon yellow! Thanks Carrie! Mine are also from the outlet. I’m usually on my back deck taking photos, so it was a nice change of scenery! Nicki, you know I’m not much of a fashionista…but I do love my white jeans so I’m always looking for ways to use them more. Thanks for all these great suggestions. And I’m assuming you loved your day in Pittsburgh…one of my favorite cities. Hugs and thanks for the advice. Hi Lynn! White jeans are one of my favorites, and this was a fun collaboration! We love Pittsburgh too, we only live about 1 1/2 hours away, so we visit often! This is a great find! My aunt does not really like white pants and I don’t really understand why! I will show her these gorgeous photos of yours and make her wear white pants!